Romiley Park is a formal park area with seating and flower beds on the corner of Sandy Lane and Compstall Road. A path leads from this area in to the open play area. This area has a well equipped children’s playground and a small football pitch. 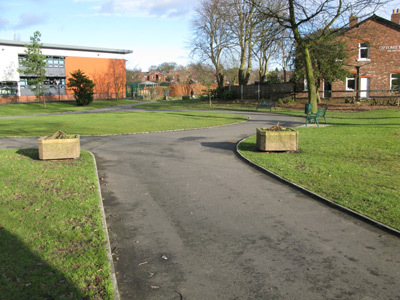 Friends of Romiley Park are a volunteer group dedicated to improving the appearance and facilities of Romiley Park and have already helped to make a number of improvements including the paly area and the flowerbeds.